Summary: Thirteen year old Connor is having a bit of a rough time. First of all, his mom is really, really sick. Then there’s his dad, who’s too busy with his other family, but Connor is pretty used to that right now. Then there’s his grandmother, and they both don’t get along at all. Finally, there’s a monster that visits him at midnight. The monster strikes a deal with Connor– he’ll tell him 3 true stories, and the forth story must be Connor’s. As easy as it sounds, Connor isn’t sure he’s ready to face what he’s hidden so deep within himself for so long. This book was…just wow. It was perfection in every sense. The words were beautiful. Connor and the other characters were fantastic. And the events just tear at you. The book isn’t that big, but it used each word, each sentence so perfectly, I couldn’t have asked for a more wonderful story to read. Connor is so multifaceted for a 13 year old– I don’t think I was that deep! But I loved his complexity so much, and I loved the other characters. It was so natural, how each of them acted, and there wasn’t any explanation other than they’re human. And then there’s the monster. I can’t say anymore or I’ll gush from excitement. What I loved most about the book was that it had a great balance between humor and the other darker emotions. Not such a stark difference, but one you recognize as part of life, and it’s just so natural. I recommend this to anyone who wants to be wowed in one sitting. 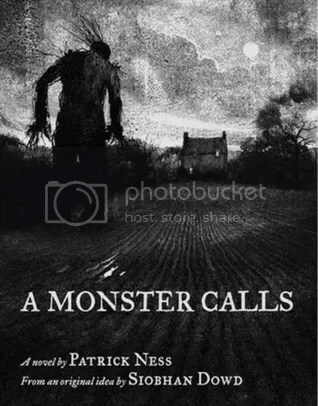 I can’t wait to read more of Patrick Ness’ work. Audience: Everyone. I mean it. It’s clean. It’s wonderful. Pick it up. Like, right now.